So apparently I have this rice thing going on lately. 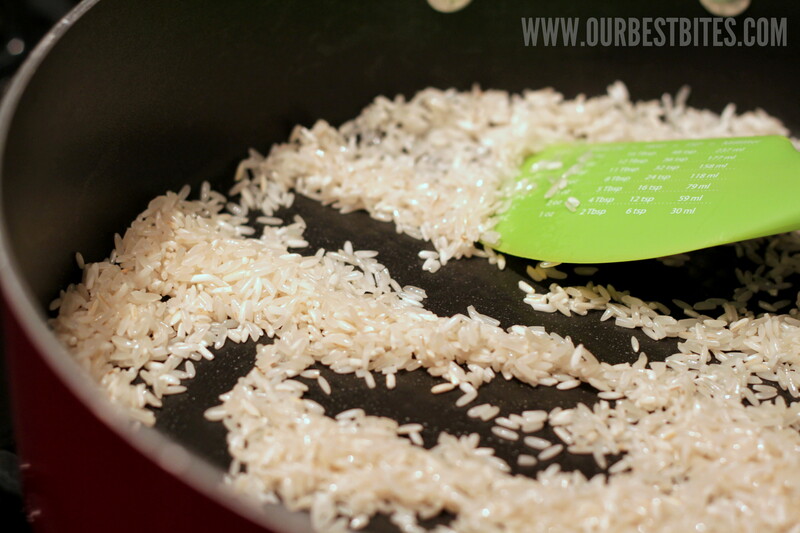 I’ve even had a whole extensive rice tutorial on tap for months now to supplement replace this old, old, old post from the first few weeks of our blog because I guess rice and I are BFFs right now. 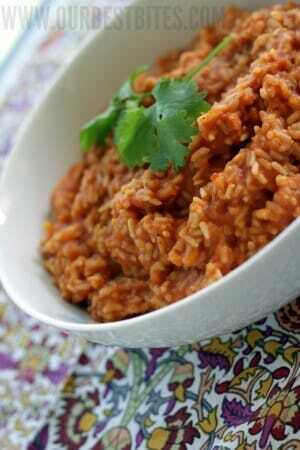 But who has time to post extensive rice tutorials when there are things like Red Chile Rice to be made? To be eaten? To be fantasized about? Because this rice and Zapp‘s Salt & Vinegar potato chips consume about 85% of my waking thoughts right now. Sometimes I feel like I’m in recipe overload. I have a million cookbooks that I haven’t cooked my way through, I get cooking magazines that don’t get read for months and months, and then there’s the blogosphere and Pinterest and Allrecipes. However…ever since we started Our Best Bites, I’ve had a little bloggy crush on The Homesick Texan. I love, love, love her recipes and, since moving to Louisiana, there have been so many times when I’ve been homesick for really, really good Mexican food. Of course, it’s not just about the Mexican food–my head is screwed on straight enough to not be truly homesick for beans or rice or taco stands–but it’s about the memories, the flavors that shaped who I am in the kitchen, how I cook, what I love. One of those defining moments was when I kind of made the shift from red rice to green rice, usually made with tomatillos and limes and cilantro. Up until fairly recently, that’s been my preference for a long time. But one night, I was just wanting good ol’ red rice, so I pulled out my copy of Lisa’s cookbook and made her red chile rice. And oh, my gosh. It was heaven. 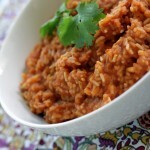 Simple ingredients, easy recipe, and unbelievably delicious–it truly had the power to convert me back to red rice. At least at home. 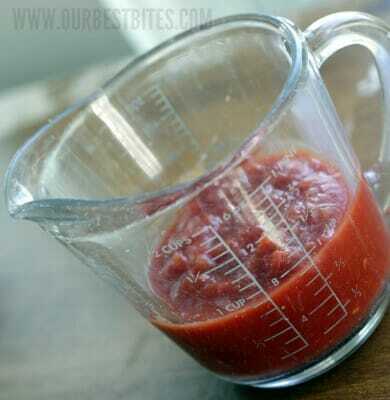 Measure out your crushed tomatoes. The recipe calls for straining them, but I found I both needed and wanted the liquid, and I’m at a very low elevation. 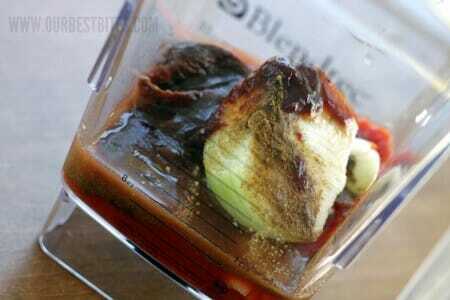 Place the tomatoes in the jar of your blender. Add the onion and garlic (don’t bother chopping either one), cumin, cloves and lime juice. 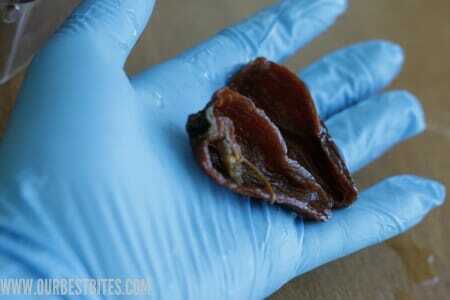 If you’re brave, pop a whole chipotle pepper in there. However, since I am a wuss prone to heartburn and because I have little kids, I snapped on a pair of latex gloves, sliced the pepper in half, and ran it under some water to rinse away the seeds (most of the heat is contained in the seeds). I tossed the seeded pepper into the blender, then I added a small spoonful or two of the adobo sauce from the chilies. That’s my little compromise. Blend the mixture until smooth and set aside. In a large, heavy-bottomed skillet with a lid, heat the tablespoon of oil over medium heat. When hot, add the rice and saute for about 30 seconds. Add the tomato puree and prepare yourself for the most delicious thing you’ve ever smelled. Cook for one more minute. 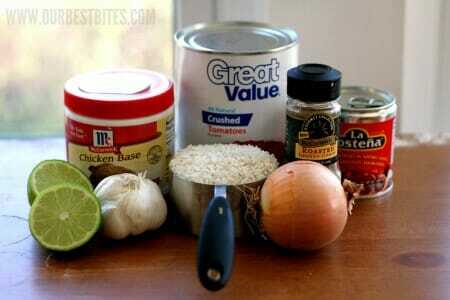 In the jar of a blender, add the crushed tomatoes, onion, garlic, cumin, cloves, and the chipotle chile. If you’re concerned about heat, slice open the chile, run it under some cool water to remove the seeds, and add the seeded chile to the blender, along with a small spoonful or two of the adobo sauce (more if you want more heat and chipotle flavor). Blend until smooth and set aside. In a large, heavy-bottomed skillet with a lid, heat the oil over medium. Add the rice and saute for 30 seconds. Add the tomato mixture and cook for an additional 30 seconds-1 minute, stirring constantly. Add the chicken broth, stir, bring to a boil, then cover tightly, reduce heat to low, and cook for 20-30 minutes (longer for higher elevations) or until the rice is cooked. Remove from heat and allow to stand, covered, for 10 minutes. Stir to combine and serve. Serves 4-6. If I had made this rice instead of those sub-standard cookies from another source-which we won’t mention (I swear, I’m never using another recipe again unless it is from OBB), I’m sure the Bishop and Stake President would have been very happy (and yes, I like your parenthetical commentary to every ingredient)! Being a Texan, I cannot even imagine being taken away from our amazing Tex Mex. I love the Homesick Texan, too. She gets in right every time. And, this rice looks perfectly amazing. This looks delicious. I love Tex Mex, but don’t live anywhere near Tex Mex country. What would you serve with this to complete the meal? I want to try it sometime soon! Anything Mexican-ish–tacos, enchiladas, burritos, etc. we had chicken tacos made with the Taco Chicken here on the blog (I’d link it, but I’m on my phone) and beans. Thanks for this tip … I was just wondering the same thing. Such a great way to mix up the standard side of rice. Thanks!! This sounds delish. Right up my family’s alley. Do you just squeeze the lime juice on at the end right before you serve it? By the way, I’m such a fresh citrus junkie now thanks to you guys! I cringe whenever someone pulls out the bottled stuff! This sounds easy and yummy and wow! Btw, I love you for this: “Add the onion and garlic (don’t bother chopping either one),” Best. Parenthetical. Ever. Looks yummy, but uhm, what to serve it with. I am a failure. You’re not a failure! 🙂 See comment 4. Yep, of course! I’d increase the broth by 1/4-1/2 cup and I’m not sure how much longer it would have to cook because this rice already takes longer than regular white rice. Oh, I am SOOOO in love with the peppers in adobo sauce right now. They totally make my skirt fly up. Can’t wait to try it! It looks so delicious! This is similar to how I make my arroz at home. I’ve never tried it with chipotles. I sometimes add green chiles and shredded chicken to make it a meal. Nice post. Also, when you said red chile I was thinking of making chile colorado sauce…like when you take the dried chiles and make the sauce so I was kind of thrown off. Do you guys know how to make that? I can forward a recipe if you’d like. It’s one my favorites for enchiladas. My question has nothing to do with the recipe, but is – Where did you get that wonderful green spatula? I really think that I need one of those. The recipe looks yummy too. Looks awesome! I’m making tacos tonight so it’s fate 🙂 Question, though – no crushed tomatoes on hand…if I already have a can of puree could I use that? Just worried about liquid amount and don’t want soupy rice or something. Hmmmm. I imagine it would probably be okay–crushed tomatoes are like a very thick puree. I’ve just never tried it (and I wouldn’t add any additional liquid unless it looks like you’ll need it). Hi there from Down Under Australia…i don’t think i can get canned chipotles in adobo sauce here 🙁 what can i use as a substitute instead? Maybe some piri piri peppers, also known as peri peri. Do you have those in Australia? My green rice recipe depends on a green bell pepper, not tomatillos. So since I decided I prefer red bells to green, the same recipe has turned orange. Is that a redefining moment? My husband makes this and I love LOVE it! And he hardly cooks! This looks awesome! I think it would go perfectly with some enchiladas. One thing — you mention crushed tomatoes in the text, but the ingredients list says tomato puree. I need to take rice to a Blue and Gold banquet. How much does this recipe make? Well, the recipe says that it serves 4-6, but I think in those kinds of situations, you could probably get away with 8-10 because people eat so much less. Except for the fact that they’re boys. So maybe 6-8? It will make a little more than 8 servings that are 1/2 cup each. I love The Homesick Texan too. You should try the Kolache recipe, I’ve only made them savory with sausages. Does anyone have any suggestions what to do with the rest of the can of chipotles in adobo sauce? It seems all the recipes I have just call for 1 or 2 chilis. Can it be frozen? Hi Kate. This looks really yummy! Would this be good served with the baked chicken taquitos, or is it not really the right flavor combos? Would the lime-cilantro rice be a better side dish with the taquitos? What do you think? Yep, this would be great with taquitos! I made this last night with tacos and my whole family loved it. Since my kids can’t take much heat I just used a spoonful of the adobo sauce and a small piece of chile. It added a great amount of flavor without the heat. So excited to try this great alternative to using boxed rice mixes! I am new to your site and am in love!! You ladies are amazing! I fixed this for dinner tonight, and my husband can’t stop eating it. YUM! Thanks for sharing. I’m a vegetarian, can I either substitute the chicken broth for vegetable broth or just leave the broth out of the recipe? This was delicious! The print version of the recipe doesn’t say when to add the lime juice so I left it out. I used 1 cup of Trader Joe’s diced tomatoes with green chiles, which worked well. Even with half a pepper it was still too spicy for my son but I’ll definitely try again. I may have the leftovers with eggs.